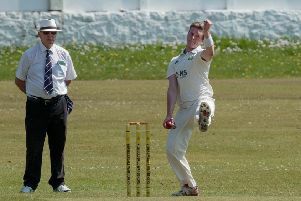 Ribblesdale Wanderers had victory in their sights against Oswaldtwistle Immanuel at Church Meadow but were somehow chewed up by the jaws of defeat. A bright spell of bowling from Sam Jackson, who took 4-43, complimented by professional Primosh Perera’s 3-18 put their side in to the ascendency as the visitors were restricted to 147. However, standards slipped significantly with the bat with only three batsmen able to conjour up double figures. Sri Lankan all-rounder Perera made 12, Jackson top scored with 38 down at number seven while Omar Hussain chipped in with an unbeaten 11 at the tail end. That was enough to gift the away side a 41-run win, rewarded with maximum points.